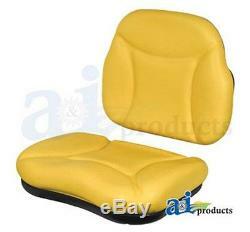 Cushion kit is for A&I A-RE62227 seat only, will not interchange w/ OEM seat. Dim A (1): Kit contains seat back bottom cushions. John Deere TRACTOR 5200 5300 5400. The item "5000SCKIT Kit Seat Cushion Yellow (for RE62227 Seat) John Deere 5200 5300 5400" is in sale since Thursday, June 30, 2016. This item is in the category "Business & Industrial\Heavy Equipment Parts & Accs\Antique & Vintage Equip Parts". The seller is "justauctions" and is located in Grand Rapids, Michigan. This item can be shipped worldwide.